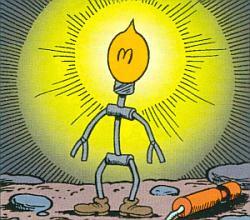 In Gyro’s First Invention Don Rosa shows that the Helper was constructed in 1952. 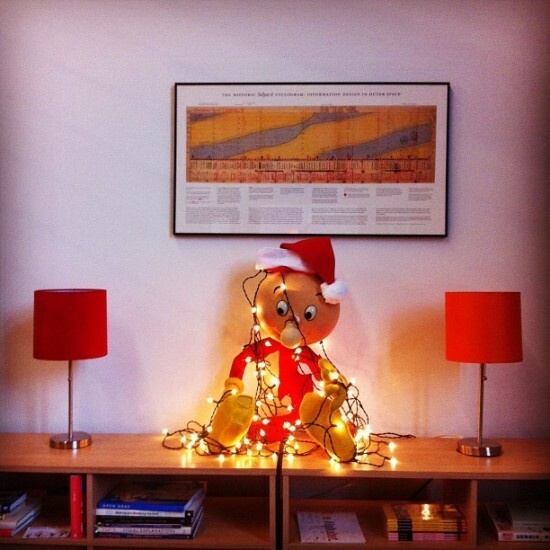 He is built out of a lamp previous owned by Donald Duck. Some mysterious way the lamp became alive and intelligent when Donald accidentally hit Gyro in his head with it so that Gyro’s head hit his unfinished mindbox. Later Gyro gave the main part of the lamp mechanical legs and arms so that it could be able to cross obstacles. To avoid vibrations while moving it was also equipped with dolls shoes … and finally Donald put on a light-bulb so that it could light up its surroundings. Pretty neat. 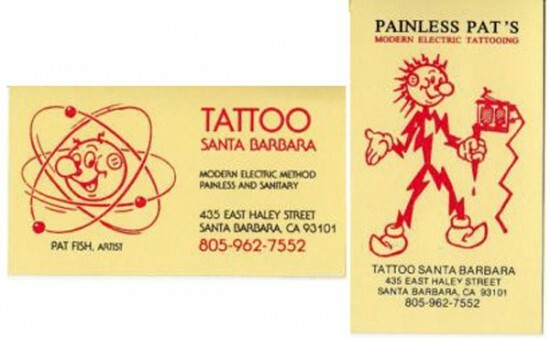 Hat tip to Tom R. for pointing him out. Check out the Gopher State Railway Museum’s train featuring Reddy Kilowatt as the engineer (scroll down after following the link). From Just a brief history — the locomotive was built in 1940 by Electromotive Corporation for the Chicago, Burlington & Quincy Railroad. NSP accquired the locomotive in approximately 1973 from the Burlington Northern Railroad, to switch its St Paul, Minnesota coal-fired High Bridge power plant, where it worked unitl 1996. 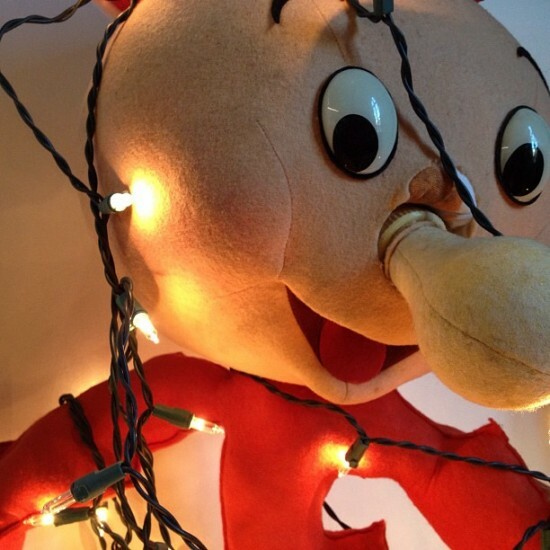 It wore the slightly modified Reddy Killowatt figure from 1973 until it was retired in 1996. 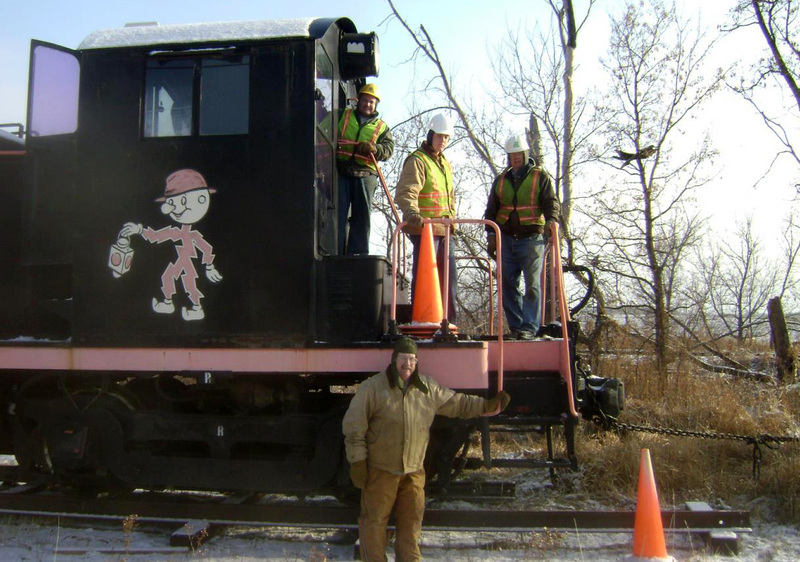 Because of its heritage and unique paint job, NSP generously donated the locomotive to the Gopher State Railway Museum (located in New Prague, Minnesota just south of the Twin City Metro area) where it now resides, still prominently featuring Reddy in his hard hat and railroad lantern in hand. 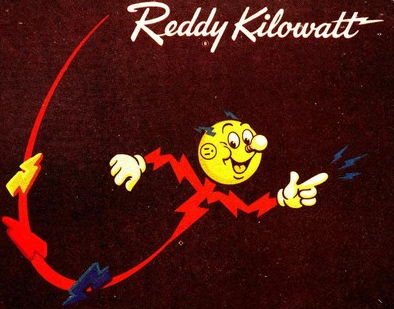 Here’s a little article on Examiner.com: An animated spokesman for electricity: Reddy Kilowatt. Strangely, the URL reddy.com does not go anywhere. Here are some items sent in by reddykilowatt.org readers. Thanks! 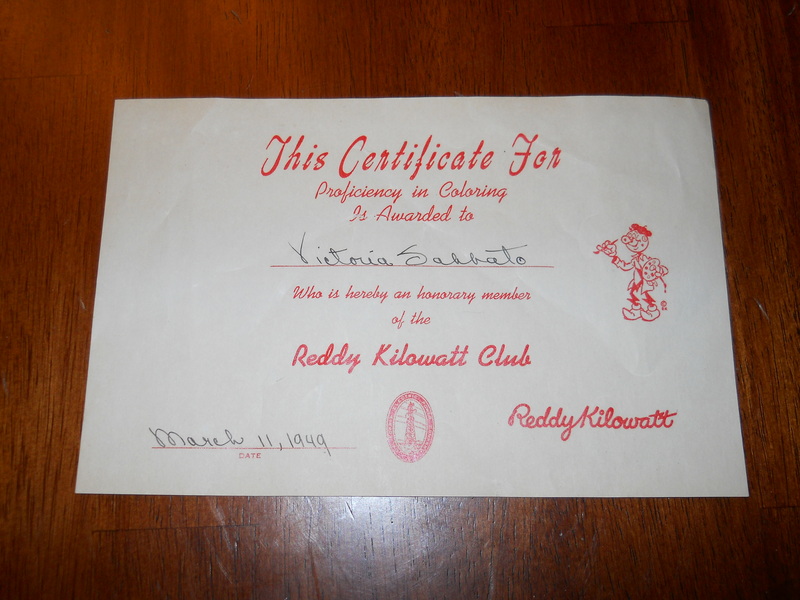 First, a great certificate from 1949 for “Proficiency in coloring” from the Reddy Kilowatt Club. Victoria Sabbato was six years old and in kindergarten at Sierra Seville School in Fontana, California when she received this. Second, here’s a cooking chart provided by the Ohio Edison Home Service Department, submitted by Brian G.
Thanks folks! Feel free to send in your Reddy memorabilia. 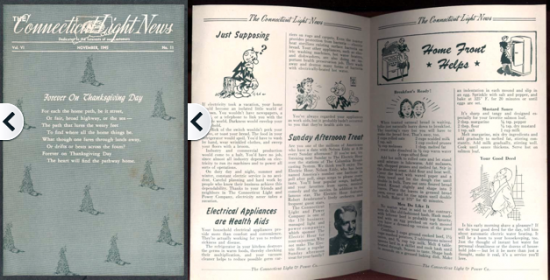 Here’s a 1945 issue of Connecticut Light News ’45 for sale with some Thanksgiving Reddy Kilowatt action in it. And if you’re crazy enough to go shopping tomorrow, try buying local! 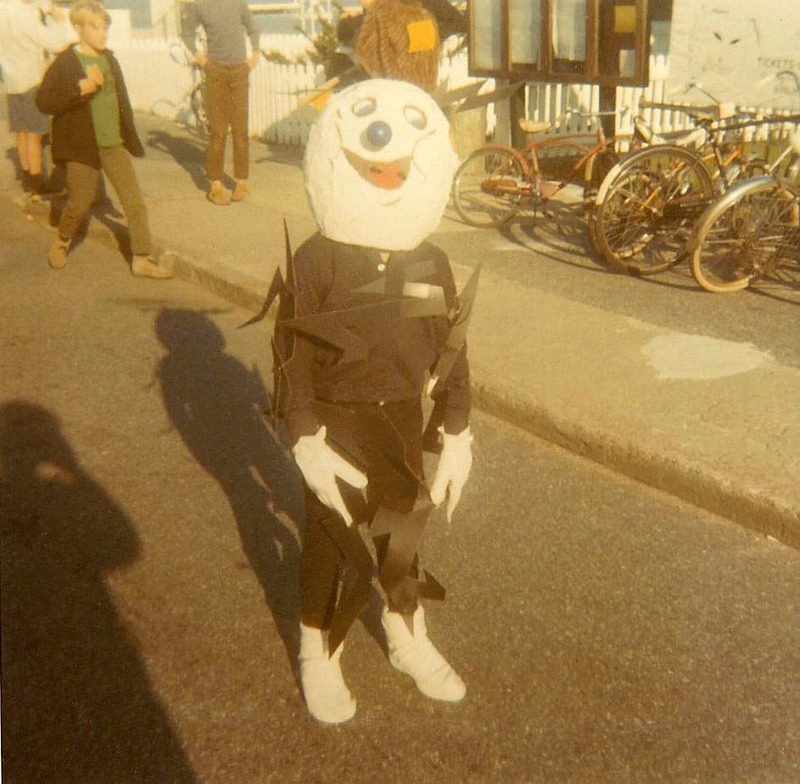 Here’s a great photo & memory from Mr. Nathan J. Foulds of Franklin, N.J.
My Mom always hand-made theme-based costumes for my brothers and I to march in the annual Halloween parade in Packanack Lake, a close knit lake community that is part of Wayne Township, N.J. It had population then of about 45,000. This one was Halloween 1969 and won for best original costume. I was also a horse, a Gerald Ford ‘WIN’ (Whip Inflation Now) button, the Michelin (Tire) Man, Cousin IT (The Adamm’s Family), a flagpole w/American flag (she even asked for and got permission to hand-make the American flag).